Back when people could afford live – in help, the people who lived in my house had some. This is a corner of the aoartment where they lived. I’m not entirely sure of the original floor plan. I know that there was a room that connected the apartment to the house. I’ll use it as my photo studio. What remains will be a fairly decent one – bedroom place. 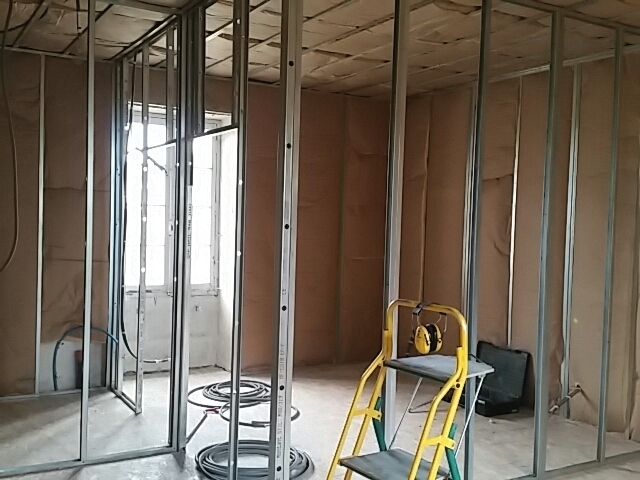 You are looking through the framing toward the bedroom, on the right, and the bathroom. I am standing in the living room. The kitchen is to the left out of camera range. To give you an idea of the scale, that bedroom will hold a 180 cm (California king-size) bed with room to move on either side, plus an armoire. As you can see, the light is good. Not only are there large windows in the bedroom and living room but the three doors to the outside are windowed. Behind me and to the left is a small private terrace, sunny and protected from the wind. The space is smaller than before because of the massive amount of insulation that is going in, of the old – school, fiberglass variety. If the guys had asked, I think I ‘d have gone for the sleek, shiny NASA stuff like in the house but they didn’t and probably saved me some money. It will be fine. Room for an armoire ( and a coiffeuse) is good, we can do that in two of our bedrooms but not the third, but it has other redeeming features. Are you going to actually allow paying guests into your castle? OMG, you cannot believe how I am being lobbied to do a whole gite thing. The apartment was just there, so I did it. It’s those barns that have everybody going. The contractors swear they can knock out half a dozen units for pennies. Eurocents. My handyman, who is married to a pastry chef, is doing an upsell, assuring me that the real money is in doing a sort of chambres d’hotes, where each morning you deliver a breakfast basket — baked by the wife, of course. I’m having to tell them all to back off, please, until the dust settles on said castle and I see whether I even have any eurocents left. Besides, we have only an eight-week season, here. I’d really have to run the numbers. If it’s an eight week season forget it. Only reason we are considering mini gite venture is that we already let out the seaside apartment and and were going to offer a coast and country option combined with la cave ( our season 20-24 weeks) . There is an incredible amount of work involved, even in self catering gites, as I have found out just having one compact & bijou one bed place in Argeles! And I ****ing hate ironing bed linen! That’s how I’m feeling about it. Even twelve weeks might be worth the hassle but eight? The handyman and his wife would be the big winners. Between his and his wife’s work during the season and the cost of winter maintenance, I just don’t see it penciling. Previous Post Skylights are in! Next Post Drywall.And about time, too.